This 1952 film by Akira Kurosawa really opened my eyes. I knew Kurosawa from films like Seven Samurai and Throne of Blood. Ikiru is different. 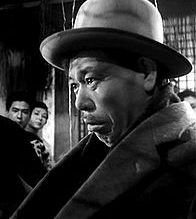 Ikiru, while it uses many of the same actors as Seven Samurai, seems to have more in common with Ozu’s Tokyo Story than with some of Kurosawa’s later epics. I say “seems” since it is clear that a lot is going on in this Kurosawa film that you can miss on a first viewing. The story is fairly simple: a near-retirement civil servant (played masterfully by Takashi Shimura ) realizes his life has been wasted in a dead end job when he learns he is dying. He sets out to experience something new in the little time he has left. This causes consternation among his family and co-workers. Some of the story is told in real time, some in flashback. Thankfully, Kurosawa does not descend into sentimentality or mawkishness, and because of this, the realism and humanity of the film shows through. The commentary on this Criterion DVD release is highly informative and points out numerous technical details as well as references to Japanese post-war recovery that were incorporated into the film. High points should also be given to the subtitles. Even though hard to read at times due to being white on (an occasional) white background, the quality of the translation is excellent and very expressive of what we see going on the screen.